Prime Minister Stephen Harper today participated in a ceremony at Queen’s Park in Toronto to present Diamond Jubilee Medals to 17 Canadians for their outstanding contributions to Canada. The Prime Minister was accompanied by the Honourable David Onley, Lieutenant Governor of Ontario. Created in honour of Her Majesty’s accession to the throne on February 6, 1952, Diamond Jubilee Medals recognize Canadians who have made considerable contributions to Canada or whose achievements abroad have brought credit to the country. This medal presentation is but one of many special events that have taken place throughout the Diamond Jubilee Year, which will see a total of 60,000 Diamond Jubilee Medals presented to deserving Canadians. Other Diamond Jubilee celebrations have included themed festivals and special events, in addition to a host of community-based activities across the country. The medal is administered by The Chancellery of Honours, which is part of the Office of the Secretary to the Governor General. This new commemorative medal was created to mark the 60th anniversary of Her Majesty Queen Elizabeth II’s accession to the throne. The Diamond Jubilee Medal was personally approved by Her Majesty. The inaugural presentation of the Diamond Jubilee Medal was hosted by Governor General David Johnston in February 2012, in which Prime Minister Stephen Harper participated. The medal is a tangible way for Canada to honour Her Majesty’s dedicated service to our country. At the same time, it serves to honour significant contributions and achievements by Canadians. The medal program is part of the Diamond Jubilee Year celebrations, organized by the Government of Canada. Commemorative medals, such as the Diamond Jubilee Medal, are established from time to time within the Canadian Honours System to mark special anniversaries or occasions. Since 1967, several Canadian commemorative medals have been created, including two other Jubilee medals marking key anniversaries in Her Majesty’s reign as Queen of Canada (the Silver Jubilee Medal in 1977 and the Golden Jubilee Medal in 2002). Other commemorative medals include the Canadian Centennial Medal (1967) and the 125th Anniversary of the Confederation of Canada Medal (1992). A total of 60,000 Diamond Jubilee Medals will be awarded to Canadians throughout the Diamond Jubilee Year. Medals will be presented to recipients by partners to the medal program (partners include the Governor General, the Prime Minister, the Canadian Ministry, Members of Parliament, Senators, Lieutenant Governors/Territorial Commissioners, Premiers and non-governmental organizations). The nomination process for the Diamond Jubilee Medal was launched in fall 2011. To ensure that a wide range of endeavor is recognized, partners to the medal program were invited to nominate candidates from their communities or organizations for this national honour. To be eligible for this medal, a person must be a Canadian citizen or a permanent resident of Canada. They must have made a significant contribution to a particular province, territory, region or community within Canada, or an achievement abroad that brings credit to Canada. The medal program is administered by The Chancellery of Honours, which is part of the Office of the Secretary to the Governor General. The medal, which is composed of nickel silver and features a proof finish was designed and produced by the Royal Canadian Mint and developed by the Canadian Heraldic Authority at the Chancellery of Honours at Rideau Hall. The obverse depicts a crowned image of the The Queen, in whose name the medal is bestowed. The reverse marks the 60th (diamond) anniversary of Her Majesty’s accession to the throne. 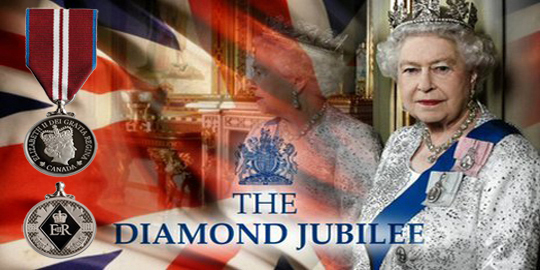 The Diamond Jubilee is depicted by the large central diamond, by the background diamond pattern, and by the dates 1952 and 2012. The imagery includes the Royal Cypher (the Royal Crown and the letters EIIR for Elizabeth II Regina), Canadian maple leaves, and the motto VIVAT REGINA (“Long live The Queen!”). The ribbon reflects a new arrangement of the blue, red and white colours of the 1953 Coronation Medal, the 1977 Silver Jubilee Medal, and the 2002 Golden Jubilee Medal. Further information on the recipients and the Diamond Jubilee Medal is available on the website of the Governor General of Canada: www.gg.ca. Filed Under: CANADIAN, FEATURED, FEATURED EVENTS, MEN "Positive Action", WOMEN "Positive Action" Tagged With: A Celebration of Women, Amanda Sherrington, Anthony Longo, awards, Bill Reid, Bonnie Brooks, Brian Levine, CANADA, Canadian Awards, Carlo Fidani, David Chen, David Cynamon, George Goodwin, Kelly Murumets, Kevin Morris, Lindsay Glassco, men, Michael Giampaolo, Paul Rosen, PM, PMO, Queen Elizabeth II, Robert Herjavec, Toronto, Victoria Ollers, Vivian Prokop, women.